Ajay Garg, a close aide of Union Railway Minister P K Bansal's nephew and an alleged middleman in the Rs 10 crore bribery case, was arrested on Tuesday after he surrendered before a Delhi court, which remanded him in the Central Bureau of Investigation custody till May 9. Special CBI Judge Swarna Kanta Sharma allowed the custodial interrogation of Garg who surrendered before the court after "coming to know through media reports that the CBI is searching for him in the alleged bribery case." Panchkula resident and a close aide of Bansal's nephew Vijay Singla, Garg said in his application that "through media reports I came to know that I have been named as an accused in the alleged bribery case. I am voluntarily surrendering myself in the court to cooperate with the CBI in the ongoing investigation." After the proceedings were over, the judge allowed the CBI to briefly interrogate Garg in the courtroom itself. The court also remanded Singla, Narain Rao Manjunath, managing director of GG Tronics India Pvt Ltd, and Sandeep Goyal, both businessmen and official contractor to the railway board, in CBI custody till May 9. 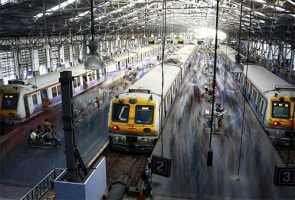 The agency submitted that their further custodial interrogation was required to know the source of Rs 2 crore, which was to be paid to Singla by accused Mahesh Kumar, member (staff) in the railway board. Kumar has since been suspended as member of the railway board. Accused Vivek Kumar, Dharmendra Kumar, businessmen Samir Sandhir and Rahul Yadav were, however, sent in 14-day judicial custody after the agency said their further custodial interrogation was not required. The CBI had sought five-day custody of Singla, Manjunath and Goyal, with its prosecutor Akshay Gautam telling the court that the replies given by them during their earlier custodial interrogation are contrary to their recorded conversation and they also need to be confronted with Kumar, the key accused, to bring out the entire conspiracy. The prosecutor also said that during the custodial interrogation of the accused they need to find out about Kumar's previous favours. The plea for the police custody was opposed by the defence counsel on the ground that the CBI cannot take the custody of their clients just for the reason that they are not giving proper answers. The defence counsel also said that for past four days the CBI is conducting raids at various places but has not recovered anything as yet and sought to know how much time does the probe agency require for the task. According to the CBI, Manjunath's firm was engaged in the business of manufacturing of railway signal products and automation railway component whereas Goyal's firm Pyramid Electronics, was manufacturing electrical equipments for railways. Manjunath was in regular contact with Kumar, who was trying to get himself appointed to a more lucrative post in the railway board as member (electrical). The CBI had said Manjunath and Kumar were also in regular touch with Goyal for this purpose. Goyal had assured Kumar that he will get him posted as member (electrical) in exchange for "pecuniary gratification." Regarding the conspiracy, the agency said the deal was struck at Rs 10 crore to get Kumar appointed as member (electrical) and a part payment of Rs 90 lakh, which was allegedly managed by accused Vivek Kumar, was made out.